Babies like to cuddle with Fernand. Fernand is 19 cm and designed by Moulin Roty. It is wonderfully soft due to the teddy fabric. So Sweetie!!! This is Sweetie, a new soft Jellycat kitten. You get this nice Maileg in a beautiful gift box. A cuddle friend for life! A dressed kitten from Maileg. This is the black chaton! A dressed kitten from Maileg. This is the Off White chaton! 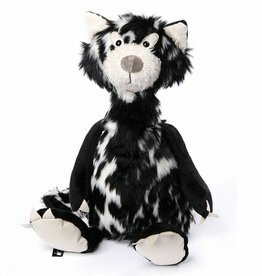 Sweet & soft Jellycat kitten! Lovely clean cuddle cloth by Moulin Roty. You can also attach a pacifier with a special velcro strap.